Rather than start a new thread, I may as well ask here if anyone knows a reputable company/person who can do this procedure for me if I purchase a 15 R3 in the UK. Just saw the r4 was over a thousand pounds more for only the 6 core i7 Vs the 4 core 7700HQ and a fix to the heating issue that shouldn't have been there. Madness. Pete Light, Mattamoe and Vasudev like this. ignore the battery, you can reduce the wear level by multiple methods.. but ur HS is the main problem.. its not even touching the core points.. otherwise ur idle would be around 40-60 max.. These are the temps I am talking about when idle. These were taken after 1 Hr of web browsing and Downloading. As soon as the download stopped the temps went down. Also from above image I feel that the core differential issue is not there with my unit, just the thermal paste and pads are not making contact. Maybe @Pete Light can help. Also from above image I fell that the core differential issue is not there with my unit, just the thermal paste and pads are not making contact. PM me your teamviewer id and pass. Pete Light, Vistar Shook and Mattamoe like this. The core differential issue in my opinion is a consequence of re-padding, i had 2c or 3c differential before re-padding which went up to 10c to 12c post re-padding. kinda weird ur system shows around 7 hours of HWINFO.. but still its just a messy HS.. from my guess. either too much crap stamp paste blocking the heat transfer.. or just the copper is not even touching flat. do a video with hwinfo on.. and upload on youtube.. and share with us.. also that might help incase dell reps want to see. Crazy temps. 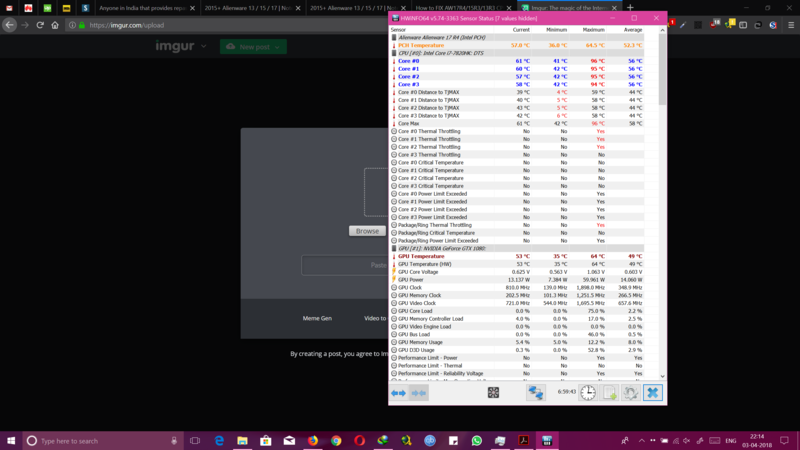 To check for core differential, you would need to put an even load on the cores, 100% on all cores, but with those temps just browsing, will be hard to do the test. Definitely have DELL fix this, totally unacceptable and basically unusable. Mattamoe and Vistar Shook like this. This is the video. Clock speeds were set to 4.0GHz. Also I wasn't able to edit the video so it might not be that good. Vistar Shook and VICKYGAMEBOY like this. this is enough for dell to give you motherboard and HS replacement, let us know what they say.